Above: The illustrators on the roof of their studio space. From left: Brian Floca, Sergio Ruzzier, Sophie Blackall, Edward Hemingway, and John Bemelmans Marciano. P&O: How did you guys start working together in this space? Sergio: It was supposed to be a brunch. It’s true. I was trying to invite Sophie, Johnny, John Rocco, and Brian to brunch—Eddie was not born yet— and we couldn’t agree on a date. We first met at the “Drawn In Brooklyn” show at the Brooklyn Library that Johnny curated and he put us all together. Brian: We all sort of knew each other before, but putting the show together was really a great thing because we all really got to know each other. Sergio: So then in the email thread, even though we couldn’t find a date for the brunch, somebody said they were looking for a studio space. Sophie: I used to work at home and I was being evicted. We did unspeakable things to our apartment and the landlord was very upset and threw us out. Mostly it was my boyfriend, who was staging a play in the basement for a year. Slight breach of contract. So I was looking for a place. Johnny, I think I emailed you first. Johnny: Right and then Rocco actually found the space, right? Brian: Yeah, he just hopped on Craig’s List. He’s a doer. Sophie: And we all came to look at the space thinking maybe three of us might take it and then everyone was in. Sergio: I was not planning to move, I never shared a space. I never shared anything, even a piece of bread. Sophie: He just hates being left out so he just tagged along. P&O: How did you find Eddie? Eddie: I went to grad school with Brian and I knew Johnny’s wife. I have a studio in my apartment and my apartment lost power after Hurricane Sandy. It still doesn’t have the boiler working. So these guys took pity on me. SOPHIE BLACKALL’S WORK SPACE. From top: Sophie at her desk; some of Sophie’s collected ephemera and a box of old photos for inspiration; a watercolor for an upcoming children’s book about where babies come from; Sophie finds inspiration for her “weird victorian children” from old photos. P&O: Do you guys get each other’s opinions on things formally or informally? Like sketches or dummies? Is that something that you guys seek out? Brian: It’s not always happening but I think when one of us feels stuck. Sophie: We’ve looked at maybe 16 different endings for Brian’s book [Locomotive]. Johnny: When I was doing the text for the new Madeline I would toss outlines and ask opinions. P&O: Is it usually more text-related than, say, this drawing isn’t working? Sophie: I know John Rocco used to show us prints that to me looked almost the same. Johnny: John [Rocco] was the big asker of opinion and giver of opinion. Brian: In a good way! Johnny: Yeah, in a good way. In a positive way, absolutely positive way. No, absolutely! Sophie: I’ll run past ideas about stories I am working on at lunchtime. Brian: With the train book that I was working on it was very much picture book kind of stuff, like how does the feeling of the book change if we moved a picture to this page and moved this beat here and broke the text up here. It was a very narrow set of things that I was trying to move around to find the right way to go out of the book, but you sort of needed other people’s good picture book eye, or I needed it, to help me see how that was working. Sophie: I think we, apart from Eddie, probably all modeled at one point or another for Brian’s Victorian train passengers doing various things and we all ended up looking like Brian. BRIAN FLOCA’S WORK SPACE. From top: Brian at his desk; some of Brian’s materials and scale models. Brian uses the scale models to help him draw things from a distance; a twenty-four hour clock; old postcards serve as inspiration for his upcoming book, Locomotive; A favorite question from a child during a class visit for Brian’s book, Moonshot. “I told them I think everyone can have facial hair now. It’s been sort of a facial hair revolution in space but initially I think you had to be clean shaven.”; Research books for Locomotive. P&O: So what are the positives and negatives about sharing a space? A lot of you were working on your own before. Sergio: I have never worked so well – honestly this is not a joke. I was always on my own and I always thought that I could never share a space but I did it by instinct when I decided to join these people and I never regretted it. I never looked back. It works really well mostly because I don’t waste as much time on the Internet if they’re around because I feel like they’re going to think I’m a jerk. Sergio: It’s a nice pressure. Yeah, very good. That’s my experience. Brian: And as we get to know each other, what the hell, let’s watch that YouTube clip. Sergio: Sure. Again, I don’t feel like, oh my God, but it’s a positive energy, can I say that? Johnny: Oh yeah, it’s a positive energy! Sophie: You will be quoted as saying that. Johnny: The only drawback that I see is just not being able to just nap at any time. Brian: I have napped! [To Eddie,] Before you moved in I napped on the table! Eddie: So I’ve taken away your nap time? Sorry. Brian: I do keep meaning to get a cot. Johnny: I once was napping there and somebody came in. It was during the summer and I just had to quickly get up and pretend that I was working. SERGIO RUZZIER’S WORKSPACE. From top: Sergio at his desk; a painting for an upcoming project; Sergio’s bookshelf; An original Arnold Lobel sketch, scored on ebay; a collection of photos of the “Mystery Spots” in California and in Oregon, also aquired on ebay; Sergio’s desk. Yes those are urine specimen jars but we are pretty sure they contain paint. P&O: Johnny, you and Sophie are collaborating on an upcoming book right? Can you tell me more about it? Johnny: It’s a middle-grade book and I had written it probably in ’97 or ’98 before I had had anything published. I planned to do it as a picture book. It was about a boy who dies nine times and it somehow wasn’t really fitting into the picture book format… I thought it was a good idea and I kept returning to it and two or three years ago I just decided A) that it wasn’t a picture book, and that B) I wasn’t really the right person to do the illustrations for it and that was also kind of a block. Sophie: …he was looking for someone sadistic and deeply troubled and thought of me! So that was nice! Brian: Who were the other two? Johnny: Oh, I could never say! P&O: What’s it like working together in the same space on the book? Normally the writer is not a part of the illustration process, let alone in the same room. Sophie: I was more nervous than anything else because I was already late with it and I was working on other things and when Johnny would come by I would sometimes put his drawing over the top of my other work so he thought I was actually working on it. It felt a little bit like having the teacher in the room but I have to say he was fantastic! He was incredibly patient and respectful. Johnny: By the way, she was just feeling guilty. I actually in the meantime was happy for her to be late because her being late meant I wouldn’t have to do the copy edits and I was late on two other books. Brian: She kept telling me to write the story and this is how the story should go and she practically had it broken down page by page and then finally I said, you should write the stuff. Sophie: He said you write it and I’ll do it so I went and wrote it and Brian was kind about it and we sent it off to an editor who said this is great, I like it a lot. The slight problem is that this book already exists. Brian: And he had published it by the way. It wasn’t just that it had existed. Sophie: Which is the only thing to save me from accusations of just complete plagiarism. I probably wouldn’t be quite so dimwitted as to send the manuscript to the actual publisher who had published a book like it already. Brian: It was uncanny because it was such a great manuscript and it would have been so much fun. The editor really liked it, and it works very differently in a lot of ways from this book that they published in ’95 but if you just sort of break down the plot points it’s almost beat for beat. Sophie: Yeah and Brian, you would make it look different, but it’s just too close for comfort. EDWARD HEMINGWAY’S WORK SPACE. From top: Eddie’s oil paints; Eddie working on a painting for an as-yet-to-be-named project; a sketch(left) and the beginnings of a final oil painting. The sketch looks like it could be a final right? Eddie uses a combination of drawing and collage for his sketches. “Actually it loosens me up in a way,” he says; Eddie’s computer with a black & white comp of the sequel to Bad Apple on screen. P&O: Those of you working on non-fiction: do you go on research field trips and come back with stacks of things or are you online a lot? Brian: For me it usually starts with books. Then there’s a lot of online stuff. I did drive the Trans Continental route for Locomotive and so I visited four or five museums on the way, took a lot of pictures, interviewed guys who are curators at these museums, bought some scale models. Brian drying his artwork. “Well you ask if we’ve learned anything from our studio mates, what I really learned here is to use a hairdryer.” Sophie notes another influence; she joined the gym after being inspired by her fellow illustrators. Sophie: And yesterday he was drawing a map of the pacific and there was a tiny speck on there which was Balls Pyramid off the coast of Australia and Lord Howe Island. We all ended up looking at pictures. Johnny: Now we all know the indigenous insect of the island, a horrifying bug. Brian: A freely roaming population of stick lobsters called tree lobsters. Eddie: You have to see it to believe it, the island doesn’t look real. It’s just amazing looking. Brian: The bugs come out at night so they had to go back to scale this steep thing at night. They caught a couple of bugs after thinking about if this was the moral proper thing to do or not, took them back, and now they’ve got a breeding program going on. P&O: And that’s not what your book is about? Eddie: In fact the island will just be a little dot on the map. Brian: I drew it with real feeling. Brian: I don’t know if that shows dedication or distractibility! A little bit of both. Sophie Blackall recently illustrated The Mighty Lalouche, by Matthew Olshan. It comes out in May 2013. She also has two books coming out in Fall 2013: the last Ivy & Bean book, written by Annie Barrows, and The 9 Lives of Alexander Baddenfield, written by studio mate John Bemelmans Marciano. John Bemelmans Marciano recently finished the writing a middle grade novel, The 9 Lives of Alexander Baddenfield (illustrated by Sophie Blackall), Madeline and the Old House in Paris, and Whatever Happened to the Metric System (a non-fiction book for adults). They are all coming out in Fall 2013. Brian Floca’s Locomotive a non-fiction picture book about, you guessed it, locomotives and the Transcontinental Railroad, comes out in Fall 2013. Elizabeth, Queen of the Sea, by Lynne Cox, comes out in Spring 2014. Eddie Hemingway illustrated Tiny Pie, by Mark Bailey and Michael Oatman (and with a pie recipe by Alice Waters). It comes out in May 2013. Bad Apple’s Perfect Day, his sequel to Bad Apple, is coming out in August 2014. Sergio Ruzzier has two books coming out in March 2013: Bear & Bee and Have You Seen My New Blue Socks? by Eve Bunting. Bear & Bee: Too Busy, comes out in March 2014. Check out Ruthie’s interview with Sergio here. Well this is just great! Thanks for sharing. What a great read, these guys are funny! Terrific interview Liz and Robin!! so great! one burning question: why does sergio have a shovel? I always carry a shovel with me. You never know. 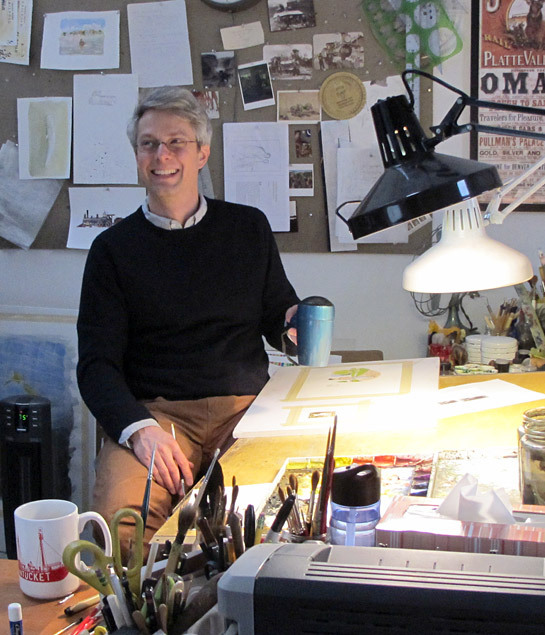 Fantastic interview, and boy do I want that Arnold Lobel print! So. Jealous. Not a print! An original pencil drawing! Not a print! It’s an original pencil drawing. What a fun collaboration! (Studio and interview) Thanks for giving us a peek into your world! What a fun collaboration! Thanks for giving us a peek into your studio! A nice treat, thank you. Especially, love seeing what everyone surrounds themselves with, your personal memoentos. I want that owl on Sophie’s wall, so sweet! I emphatically agree with all of the above comments. What a treat! It’s funny, I was playing around with the idea of doing a post on this. What a great studio. I wonder if they have room for one more…. LOVE it! So jealous of your little group. I would pose like a weird victorian child for Sophie or take a picture of myself at a mystery spot for Sergio to join your little workspace – heck, I’ll even intern and be your studio ‘doer’. Thanks for giving us a peek! This is so fun! Thanks for sharing. My 7 year old says she wants to be a doctor who writes books and illustrates them and runs marathons. I will show it to her this afternoon after school and am sure she will be thrilled to get a peek into the fun studios! That is AWESOME. She sounds like a great kid! Next PostA Pen & Oink Interview: Holy Cow! It’s Giselle Potter!